Cook pasta according to package directions. Drain pasta and rinse in cold water. Meanwhile chop the salami into bite size pieces. Chop the olives in half. Chop the provolone cheese into bite size pieces. 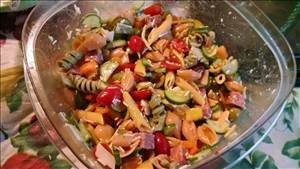 In a large bowl combine the cucumbers, tomatoes, olives, peppers, and pasta. Stir in the provolone cheese, 1/2 of the Parmesan cheese and salami. How is this low sodium? 933mg per serving? There are 251 calories in 1 serving of Mediterranean Pasta Salad. Calorie break-down: 52% fat, 27% carbs, 21% protein.